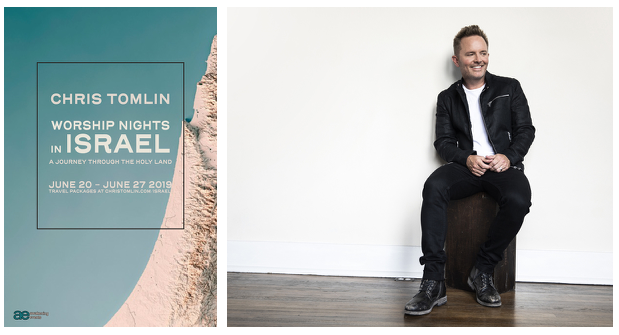 Nashville, Tenn. (Dec. 19, 2018) – Chris Tomlin alongside Awakening Events have unveiled Worship Nights in Israel. A journey through the Holy Land, the eight day sojourn will travel to Galilee, The Dead Sea, Nazareth, Capernum, Mount of Beatutudes, Garden Tomb and more, visiting numerous biblical and historical sites. The once in a lifetime trip will take place June 20-27, 2019, offering a chance to experience the places where Jesus walked along with times to gather and reflect through worship led by multi-platinum selling artist, Chris Tomlin. "Something extraordinary happened when God's people gathered to worship him. It was more than just singing—it was a declaration, a proclamation, and a time for the people to fully embody praise to God for who he is and what he has done," said Tomlin. "I would love for you to join me and others as we experience this first hand in Israel, in the very places where Jesus himself walked." Worship Nights in Israel is produced by Awakening Events and PREMIER Vacations and Events. Two varying levels of packages are being offered now for the special trip. All guests will receive Tomlin's latest release, Holy Roar, plus, a signed copy of his book of the same name. For booking and more information, visit Christomlin.com/israel or worshipnightsinisrael.com. Chris Tomlin is one of the most heralded singer-songwriters in the world who has amassed an impressive body of work. With 12 albums, 16 #1 radio singles, a GRAMMY® and an American Music Award, 3 Billboard Music Awards, 21 Dove Awards, a BMI Songwriter of the Year Award with two platinum and five gold albums to his credit and 8 million albums sold, Chris is among the most recognized and influential artists in any genre of music known around the world. It is estimated each week 20-30 million people sing one of his songs in worship. He was recently recognized as the first Christian artist to reach the Billion streams threshold on PANDORA and was presented with their BILLIONAIRE award with over 1.8 Billion lifetime spins, averaging 4.5 million streams per week. In another career milestone Chris became one of only four artists ever to receive the Sound Exchange Digital Radio Award for over 1 Billion digital radio streams, others include Justin Timberlake, Pitbull and Garth Brooks. Chris’ concert tours have sold-out venues in major cities including New York City’s Madison Square Garden, The Forum in Los Angeles, Nashville’s Bridgestone Arena and Red Rocks in Denver, among others. This spring, Chris launched his own imprint record label, Bowyer & Bow, in partnership with Capitol Christian Music Group. Awakening Events produces over 225 Contemporary Christian concerts and events nationwide in America and is consistently ranked in Pollstar's "Worldwide - Top 50 Promoter" list each year, reaching as high as 9th in North America, and top 20 in the world. For more info and a schedule of upcoming events visit: www.AwakeningEvents.com.